The pupils of Gowran National School celebrated book week by participating in several activities this week. > 'Fairytale writing' competition for 5th/6th... writing 'the real story' of a fairytale, a modern version of a classical fairytale, or composing their own fairytales. ............Read our articles on these events, along with our compositions below! infants would be reading to us. We listened closely as they read brilliantly. It was such a successful and enjoyable day! We would definitely do it again! The infants are the future! 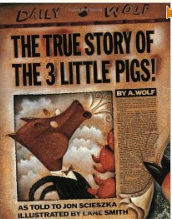 We have been challenged to write a fairy tale with a twist. It was a success and there were many entries. All the children put time and effort in to it. The prize was a €5 voucher to Khan’s book fair. The winner from Mrs. Tighe's English class was Madison Lawson. The winner from Mrs. Phelan's was Sarah O’Neill and the winner from Mrs. O’Keeffe’s class was Freagh Kelly. They were the writers of some of the brilliant stories written by the 5th and 6th classes in Gowran N.S. We hope there is another competition next year! On Friday, the 1st of March, we had a special visit from Khan. Khan owns a book shop in James’ Street, Kilkenny. She came to our school with lots of her popular books from her shop. There was a variety of books for different ages. All the classes had a chance to go and buy the books that they were interested in. If the book that you wanted wasn`t there, then you could tell Khan and she would go back to her bookshop and bring the book back to our school. The prices were very reasonable so lots of children bought many books. Everyone had a great day and we can’t wait until Khan comes back again next year!!!!!!! This week, Ms Tighe gave us the idea to make a websites for our favourite authors including Jacquiline Wilson, and Michael Morpurgo. We looked at the Roald Dahl website to get a brief idea of what we would have to do. Just click on Roald Dahl's photo to get an idea! The senior classes joined forces with the Infants during the week. 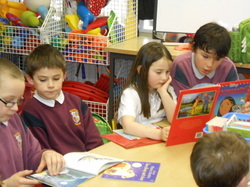 5th & 6th Class chose books to read to the Infants and then the Infants read a small story to the older children. It was enjoyed by all and we have decided we will do it more often! 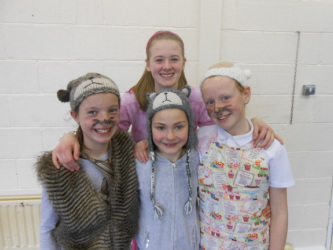 Fifth class re-enacted our favourite fairytales to entertain the infant and first classes during bookweek. We saw Little Red Riding Hood, Jack and the Bean Stalk, Goldilocks and the Three Bears, The Three Billy Goats Gruff, and others! Here is a picture of four fifth class pupils. Can you guess what fairytale they performed? Well done to all who participated... and our fantastic audience!